Today’s global society makes mobility of knowledge as important as mobility of goods or services. Gaining new knowledge abroad and applying it back at home is becoming a common practice for students and young researchers today. To promote this mobility, Ukraine and the EU began educational co-operation initiatives 21 years ago in the form of exchanges between universities under Tempus Programme. Today this co-operation has expanded into a wide network of programmes united under the new Erasmus+ programme. “For students the obvious benefit of Erasmus+ is access to high quality education in any European country,” explains Iryna Dovmantovych, an Erasmus Mundus alumna. “There is a great variety of programmes in all fields of study; and it is up to you to choose,” she says. 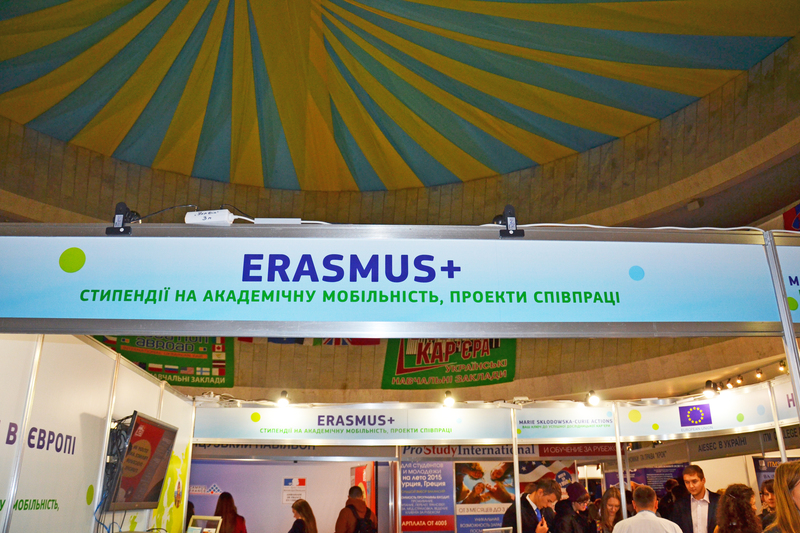 Just as one of its predecessor Erasmus Mundus, Erasmus+ emphasises the mobility of students and researchers. Ukrainian students can select a programme they want to participate at a special webpage contaning information about all the opportunities. Erasmus students have the opportunity to compare the educational approaches of Ukraine with those of the EU where universities typically foster practical knowledge and strong academic writing skills. “Another bonus of the programme is making friends from all over the world,” Iryna adds. Erasmus+ also encompasses educational dimensions other than student mobility. These include promotion of innovation, support to policy reforms, co-operation between universities, the implementation of the Bologna process, support to institutions involved in European studies (Jean Monnet Actions). These possibilities are open for participation of policy making institutions, universities, postgraduates, lecturers, businesses, and educational associations. Svitlana Shytikova, Director of the National Erasmus+ Office in Ukraine, notes that the programme’s Capacity Building Key Action (Tempus like), with the budget of over €13 million for Eastern Partnership countries for 2015, will focus on the development of quality assurance system, improvement of university governance, promotion of innovative curricula and enhancement of higher education impact on society. These funds may support up to 12 initiatives (projects) with involvement of Ukrainian universities aiming at modernizing higher education system that made result in the introduction of new curricula, implementation of Bologna tools, modernisation of teaching and learning, mobility exchange, purchase of new equipment, and professional growth of lecturers and administrative staff. Capacity Building Key Action also focuses on co-operation with businesses, developing entrepreneurial skills among students and their employability. Public and private universities can apply for cooperation until February 26, 2015. Details on the project application process are available here. Another forthcoming upgrade consists in academic mobility that becomes an additional element of the programme. Such mobility is to be bilateral and built on the parity principle, including mobilities for EU students and lecturers to Ukrainian universities and vice versa. Svitlana Shytikova expects that all these activities will increase bottom-up support for local initiatives promoting educational innovations in Ukraine: one of the major goals of the programme. The programme gives students, trainees, staff and volunteers the opportunity to spend a period abroad to increase their skills and employability. It also encourages organisations to create transnational partnerships and share innovative practices in the fields of education, training, and youth. Beginning in 2014, Erasmus+ has unified other programmes existing in the EU before, including Erasmus Mundus, Tempus, Jean Monnet, etc. The priorities and benefits of this new programmes were presented at the European education fair, held on November, 13-15 at Ukrainian house, Kyiv.